What does it mean to “edit a live survey”? Editing a live survey means making any edits to survey questions or settings, either while or after collecting responses. This may include adding new questions, editing question or answer text, changing permissions, etc. Is it safe to edit a live survey? In general, we do not recommend or support editing of active online surveys or surveys with completed responses because of the potential for data loss or corruption. We strongly recommend that you fully test your survey and work out any potential kinks before sending it to live respondents. However, we realize that sometimes issues do arise and that you need to make edits while the survey is active or after you have collected responses. How do I know what’s safe to edit and what’s not? Below are a list of common survey edits and our advice on whether or not it’s generally safe to make those edits to live surveys. Even if an action is deemed safe, we recommend always backing up your database (if you’re a Server customer) or exporting your data (for Online or Server customers) before making edits so that you have a record of your data before the edit in case something goes wrong. And if you have any doubt about whether or not you should make an edit, contact our support team before editing and we’d be happy to guide you. Result: Will change who can and who can’t access your survey. Verdict: Possibly safe, though you may be “locking out” users who previously had access to your survey. Example: You initially set your survey to Public, but then decide you want to restrict your respondents to just those users with a Checkbox login. You can change your survey permissions to Access List or All Registered Users, but keep in mind that if you have published your survey link anywhere, users trying to access that link will get an error message saying they don’t have access to your survey. Also, if you send a Checkbox email invitation to a set of users and then change your survey permissions from Invitation Only to Access List, you need to make sure all your invitation recipients are added to your Access List or their invitation links will become invalid. Result: Will change all prior and future responses to the new value. Verdict: Generally only safe if you are correcting typos or making minor modifications since all previous answers will reflect your changes. Example: You have a radio button question that asks “What’s your favorite color?” with the options Red, Blue, Green. You collect some responses then decide to edit your live survey and change the Green option to Orange. The result is that anyone who previously answered Green will now show as having answered Orange, which means your results will be corrupted. However, if you noticed after launching your survey that you misspelled Green and just want to correct that typo, it would be safe to do so. Result: Will delete the answers to that question for all prior responses. Verdict: Generally not safe. Only safe if you are 100% positive that you have no use for the collected data for that option. 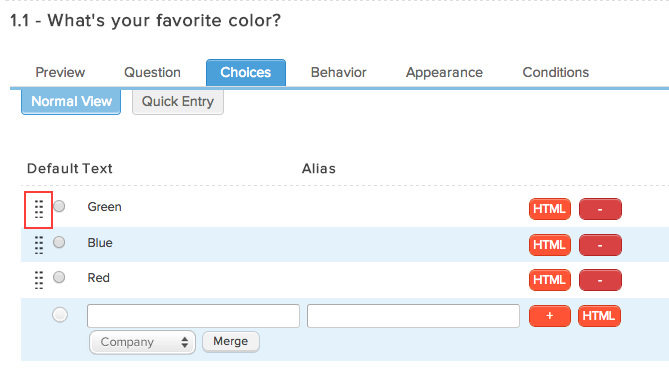 Example: You have a radio button question that asks “What’s your favorite color?” with the options Green, Blue, Red. You collect some responses then decide to edit your live survey and delete the Red option. Anyone who previously answered Red will show as not having answered that question, which may skew your reports. Result: May change and corrupt prior responses if not done properly. Verdict: Possibly safe. To safely change the order of question choices, use the Drag and Drop icon (highlighted in red below) to drag your existing choices into new positions. NEVER copy and paste or overwrite existing text with new text in order to change the order – this will corrupt your previous answers. Example: You have a radio button question that asks “What’s your favorite color?” with the options Green, Blue, Red. You collect some responses then decide to edit your live survey and change the order to Red, Blue Green. If you use the drag and drop method to re-order your existing choices, your data will be preserved. However, if you copy and paste the word Red over the Green option and vice versa, all respondents who answered Green before the change will now be shown as having answered Red, and vice versa. Verdict: Generally safe, as long as your new question text makes sense for both old and new responses. Example: You have an open-ended question that asks “Where were you born?” After collecting some responses, you decide this isn’t specific enough and change the text to ask “In what city were you born?” This won’t “hurt” anything in your survey, but if someone answered “United States” before you edited the question text when you run your report or view your results, your prior responses may not make 100% sense according to the new question text. Result: All responses to that question will be deleted and ARE NOT RECOVERABLE. Verdict: NOT safe and NOT recommended. Instead, we recommend using the Deactivate option under Item Actions to deactivate a question you no longer want respondents to answer. 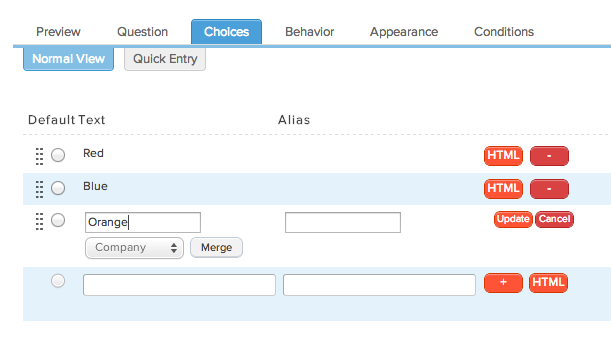 Action: Move a question within the page or to another page. Result: All past and future responses will display the question in the new position. If the question contains conditions or you have other item or page conditions based on that item, you may “break” your logic and corrupt your responses. Verdict: Depends on whether or not you have conditions contained within or based upon the option. Because of the potential for data corruption, if you have any conditions, this actions is generally NOT recommended for live surveys. Result: The new HTML/Message item will show to all new respondents. If you view or print a prior response, you will see the new HTML/Message item display. Verdict: Generally safe, just keep in mind any changes when viewing or editing prior responses. Result: May affect survey logic and corrupt data. Verdict: Only safe if you do not have any conditions or branches located within or dependent on the page you are moving. Because of the potential for data corruption from moving around pages or items with conditions or branches, this is generally NOT recommended for live surveys. Example: Page #2 contains a condition that is based on page #1. If you move page #1, your condition on page #2 will be deleted and may affect the past and future responses. Result: Will delete all responses to all questions on that page, which CAN NOT BE RECOVERED. Verdict: NOT safe and NOT recommended. Instead, we recommend using the Deactivate feature to deactivate all items on that page, which will essentially deactivate the page. Verdict: Don’t do it. Ever. Trust us on this one.